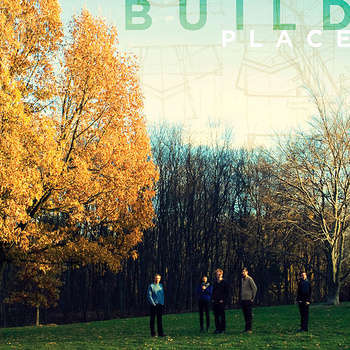 Build released Place, its second album, in 2011 on New Amsterdam Records with distribution by Naxos. Place consists of 9 new tracks that build upon the language of the self-titled first Build album. It is an expansive hour-long album whose tracks work both individually and collectively to create a cohesive dramatic arc across the entire album.Place uses a more sophisticated production that heightens the sound of the live band, brings out the core feeling of the individual tracks and creates at times a more tactile, more orchestral or more aggressive sound through the layering of tracks, processing of sounds, placement of mics, etc. The increased studio time that allowed production approach was funded in part by fans through a Kickstarter fundraising campaign. Build released its self-titled debut album on New Amsterdam Records in the summer of 2008 and in 2009 it was re-released with distribution from Naxos. It has received critical acclaim from both esteemed classical music critics and indie bloggers alike includingBloomberg News’ Alan Rich who praised its “skittery, unpredictable and utterly charming musical inventions”, Seattle Sound Magazine which stated “…the surreal wonderland Build leads you through is endlessly fascinating and often gorgeous”, and Sequenza21which praised the performances on the disc: “If you listen, you hear that the rhythmic profile of the piece is treacherous. The performers make it sound easy, effortless, and improvisational.” Recorded with a DIY ethic and miniscule budget, tracks from Buildnonetheless went on to be played extensively on several of NPR’s major programs including All Things Considered, Morning Edition and Weekend Edition. Build has performed at clubs, art spaces and concert halls throughout New York and across the country. Recent and upcoming performances include the Chelsea Art Museum (NYC), Joe’s Pub (NYC), UCSD’s ArtPower! (San Diego), the Carlsbad Music Festival (San Diego), Zipper Hall (LA), Montalvo Arts Center (California), the San Diego Museum of Art, and the 2009 Bang on a Can Marathon from which their performance was selected as a highlight for WNYC’s New Sounds by John Schaeffer.